Olivia Kaur Chadha began her writing career with a stint in Los Angeles writing comic book scripts. 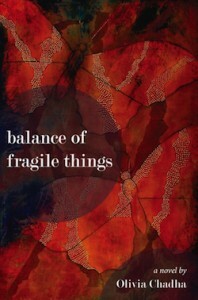 Balance of Fragile Things is Olivia's first novel, and some of her other works have appeared in Pinyon, Damselfly Press, and Every Day Fiction. Olivia holds a Ph.D. from Binghamton University’s creative writing program and a master's from the University of Colorado, Boulder's creative writing program. She has taught writing at Binghamton University and the University of Colorado, Boulder. Like her stories and characters, Olivia brings a diverse perspective to her writing: She was born in Illinois, raised in New Jersey, and grew up in Southern California. She is first-generation American of Punjabi Sikh and Latvian/German descent. Currently she's working on a sci-fi YA series set in a landscape based on a future India. Copyright © 2019, Olivia Chadha. All rights reserved. To change this footer click here.